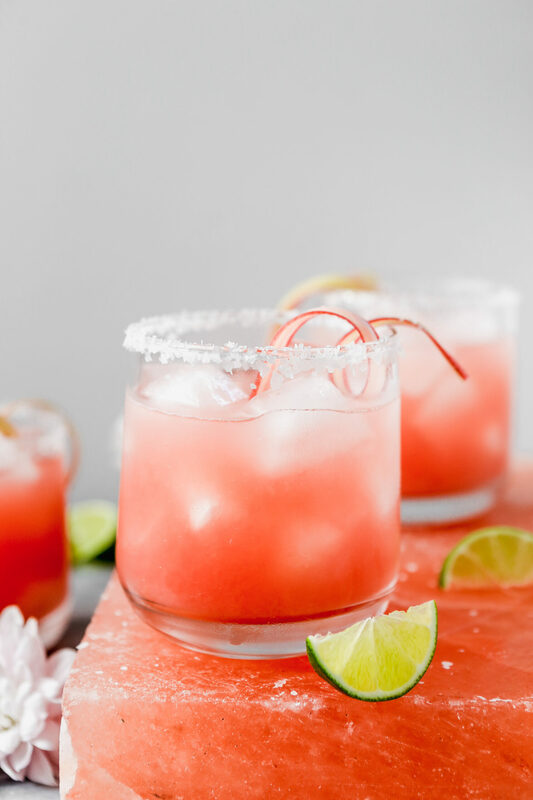 Tart, refreshing, and naturally sweetened, these Rhubarb Margaritas are perfect for spring and summer. Plus, requiring just 7 ingredients, these are easy to make too! 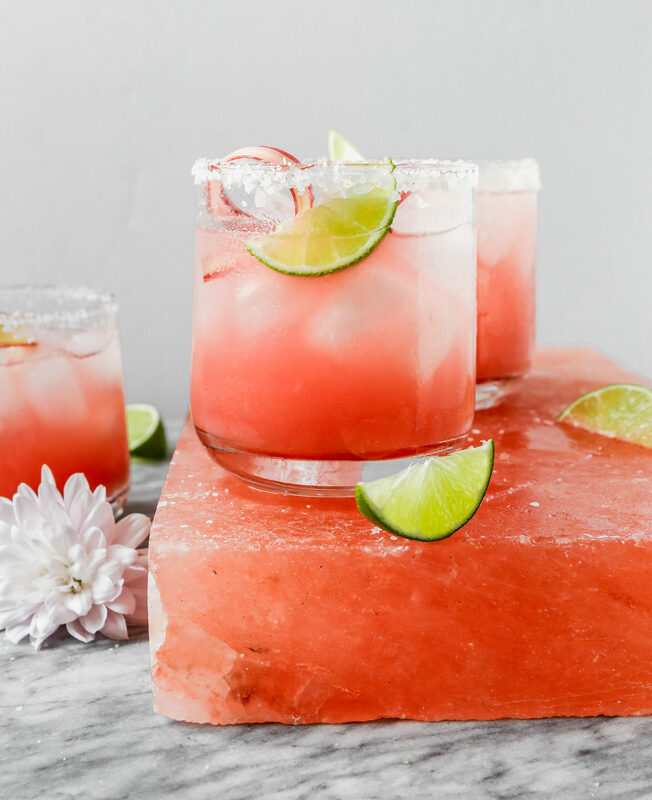 There’s nothing quite like a classic margarita, but when Cinco de Mayo is near, or when the weather starts to warm up, a unique and seasonal take is always refreshing. 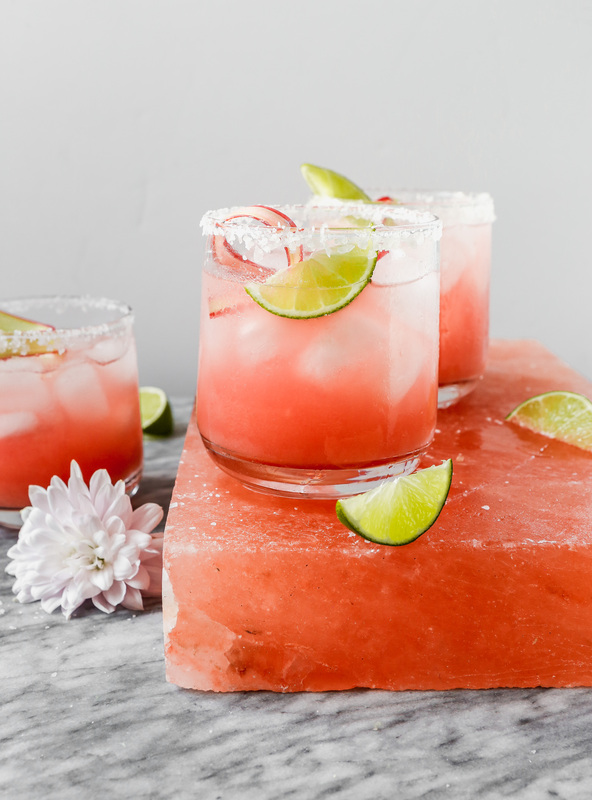 This Rhubarb Margarita is classic at heart, with a vibrant, yet tart twist. When it comes to cocktails, there’s just something about a margarita that I can’t say no to. That combination of tart, salty, and just a bit of sweetness is pure perfection, at least in my opinion. I prefer my margaritas on the tart side, so I usually keep the added sweetness to a minimum. 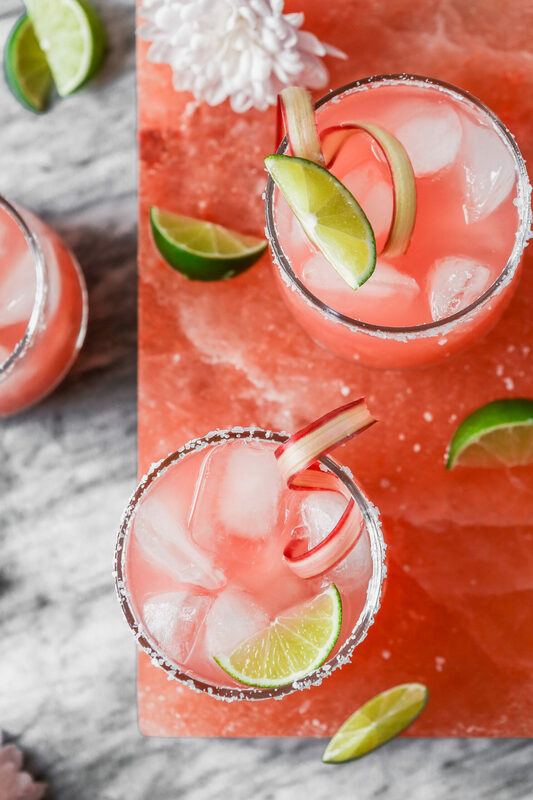 But if you’re a sweet tooth through-and-through this Rhubarb Margarita is still a must. I don’t know about you, but I get a little crazy when rhubarb season rolls around. I just can’t help myself! Those ruby, jewel-toned, stalks are a sign of spring and a shift to lighter, fresher fare. Last year I used rhubarb in a few different boozy applications, like this Sparkling Rhubarb-Lemon Ice and a Rhubarb & Strawberry Sangria. So in celebration of Cinco de Mayo and #MargaritaWeek in full swing, it only felt natural to use rhubarb in a marg! 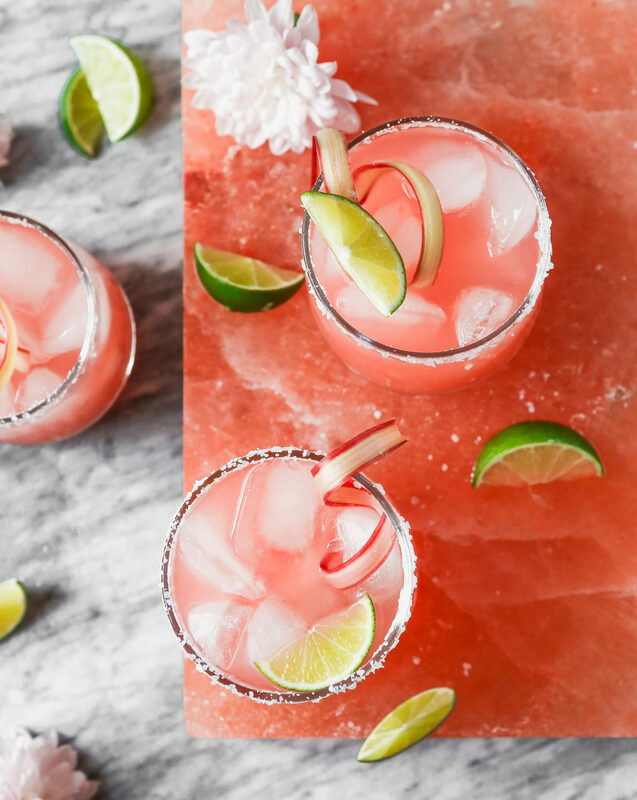 And let me tell you, this Rhubarb Margarita is as delicious as it is gorgeous. I mean look. at. that. color. 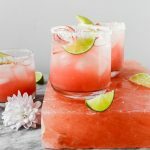 This margarita is easy to whip up, it just takes a bit of advanced planning due to the rhubarb syrup. But the syrup is mostly hands off, so, no sweat, you can do this. 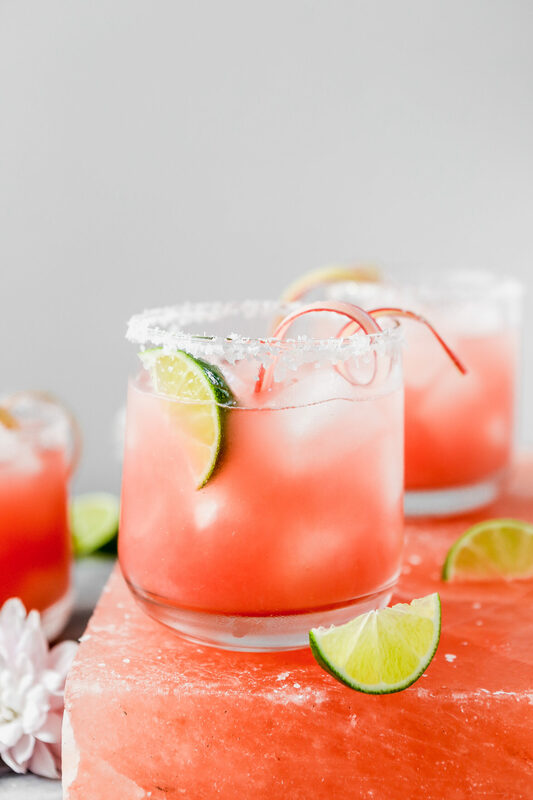 After making the rhubarb syrup, the margarita components are classic—fresh lime juice, silver tequila, and orange liqueur. Even better, with the syrup made ahead of time, you can make one marg, two margs, or a big batch of margs. Perfect for spring or summer get-togethers, small and big! Want more margs?! Head on over to ¡Hola Jalapeño! 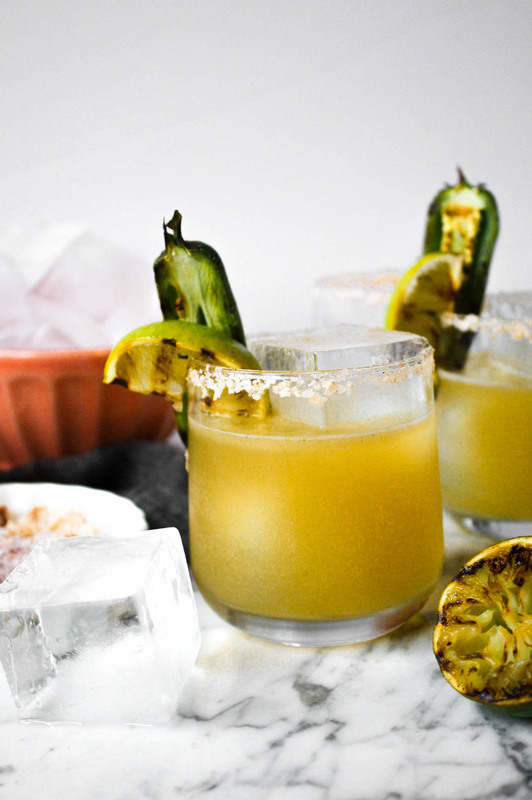 for a complete list of recipes from this year’s #MargaritaWeek. And cheers to Kate for hosting Margarita Week and wrangling all of us marg lovers together! Run a lime wedge along the rim of a rocks glass, dip rim in salt then fill glass with ice. Lime juice, rhubarb syrup, tequila, and liqueur in a cocktail shaker, fill with ice and shake until thoroughly chilled. Strain into prepared glass, garnish with lime wedges and rhubarb ribbon; serve. Run a lime wedge along the rim of four or five rocks glass, dip rims in salt then fill glasses with ice. Whisk together 1 cup (8 ounces) lime juice, 1 cup (8 ounces) rhubarb syrup, ¾ cup (6 ounces) tequila, and ½ cup (4 ounces) liqueur in a pitcher. Pour into prepared glasses, garnish with lime wedges and rhubarb ribbons; serve. The syrup makes about 1¾ cup syrup which will make 8–10 drinks, depending on how big they are! Store the syrup in a container with a tight-fitting lid in the refrigerator for 1½–2 weeks. Want more margs?! Check out some of my favorites below! 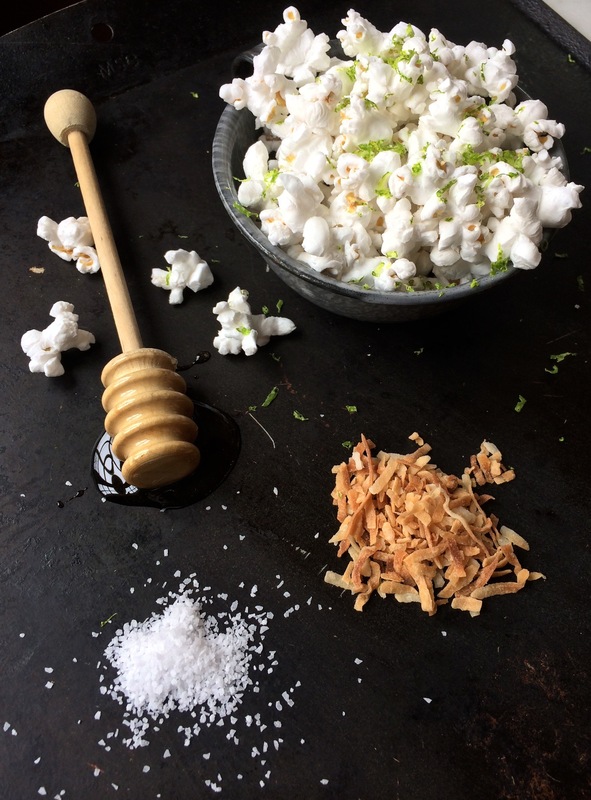 How about some Margarita Popcorn? !